One of Canadian theatre’s most beloved and inventive directors, Peter Hinton has been lending his artistic eye to The Shaw Festival of late, creating some of the most succesful productions in the past few years. Among his biggest hits was 2013’s Lady Windermere’s, the Oscar Wilde darling that earned him his Best Director nod. 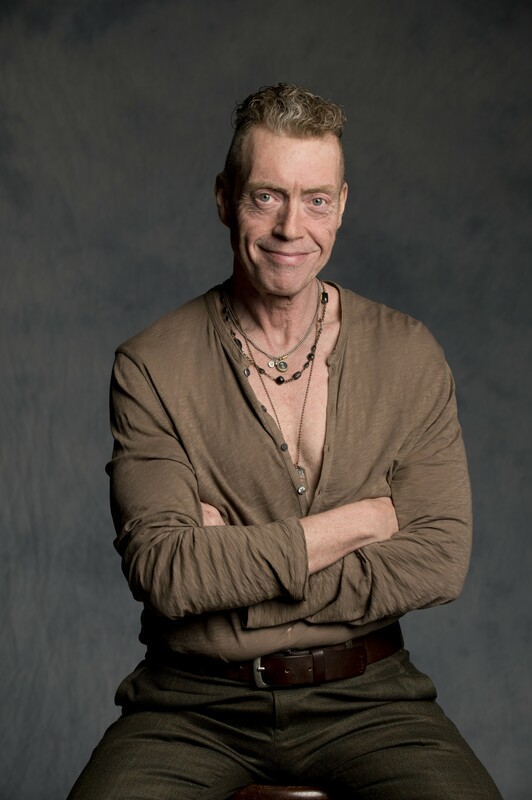 Currently in the final throws of Cabaret rehearsals in the Shaw Festival’s home of Niagara-on-the-Lake, Peter found a few moments to talk to us about his process and what’s coming up next for him. My first experience with theater. Oh my gosh. Well, I guess it would be playing as a kid and stuff. It goes back that far. You know, all children play and pretend to be other people. It’s said we learn the principal of theater playing hide and seek or peek-a-boo in our mother’s arms. Just think about it; we close our eyes and go “where is she?” and we actually entertain in our imagination of being alone. And we get off on the thrill of that imagination of that, and that’s our first time imagining the scenario of a theatrical moment. And we do it in play and taking on a character, and I loved that as a kid. I had a big family that I was raised in so that was part of it. And then really sort of formally, when I was a teenager I wanted to be an actor, so I went to the writers and actors theater school in Toronto and trained as an actor and found that I loved the whole process of creating, of solving the problems, of figuring how do we do this? I loved rehearsing and I didn’t like performing so much. So I sort of left acting and naturally evolved into a director and I’ve been doing that for about thirty years now. I really like the challenges of the rehearsal hall. How do you imagine something? How do you solve problems? How do you create an environment for the narrative to take place? How do you integrate a whole group of different people with different thoughts and put them into one world where they’re breathing the same air. That’s an incredible challenge, and that’s what really led me into directing. And I’m very fortunate to be able to do almost an equal mixture throughout my career of classical text, new works, musicals, plays and each one has its own demand and its own way of finding the journey towards its destination. Well, it varies on the show. Sometimes I pick them and lobby for them, and sometimes they pick me and in cases like Cabaret or Lady Windermere’s Fan there’s a very brilliant artistic director here at the Shaw named Jackie Maxwell. And she’s always looking at this repertoire of plays written between 1856 and 1950, the time of George Bernard Shaw, plays about the time in which he lived, the ideas that were forged during that time, plays by him and his contemporaries. So she is always looking at this repertoire and trying to match interesting partnerships of scripts to actors and directors. So it was Jackie who came to me a year and a half ago and asked if I’d be interested in doing Cabaret. Does she ever give you a hint as to why she thought of you for a specific text? Yeah, sometimes. Like when we’re talking. But it’s funny, when I get asked to do something, when I first read it, I think about that. I think, why would I be invited to do this? What is that person saying in this sort of alchemy between my sensibility and the play’s sensibility. I sort of felt an affinity towards the pieces right away when I read them and really interested in their subject matter, their form, and a real appeal for their ideas. So you’re assigned a text by Jackie. How do you start to approach creating your artistic vision for it? Well, you read it, and again it’s different with each play. What I like to do is I really like to look at the world from which the play came. I like to do a lot of research for that, as to the history of the play, of the author and try to get myself inside their head. With Lady Windermere, what was happening in the world in 1892 that was provoking Oscar Wilde to see the world he did. Cabaret is a really interesting mix, based on a set of short stories by Christopher Isherwood called ‘Goodbye to Berlin’. So looking at the Weimar Republic and Berlin in 1929 and 30 from the perspective of an Englishman and then equally important is looking at John Kander, Fred Ebb, how the original director commissioned Cabaret, in America in the 1960s. What were the relationships between Germany between the wars and America in the 60s? There’s some really striking comparisons between the two worlds so, to begin in that world, and then always back to the text. So that sort of vision for it evolves. That dialogue from what kind of light does the play try to shed upon the world that it was created in and what does that mean to us today? What do you think is the best think you’ve ever directed? Oh, that’s sort of like asking which is your favorite child. [Laughs] When I get asked that question, it’s difficult because every piece you do, you are giving it everything you have. And sometimes a piece speaks to an audience. Sometimes it doesn’t. Sometimes you’re shocked when it doesn’t. Sometimes you’re really surprised when it does. And so, the best is a very hard thing to assess because I don’t really think there’s a definitive thing there. There’s been sort of successful things that communicate and then things that don’t. I mean sure, there are projects that I go, my God, I would have done that differently I would have done this differently. But the ones where things feel like they line up. Where the interpretation, the skill sets, the virtuosity involved and the zeitgeist, speaking to a time and an age they become very, very special. Certainly, Lady Windermere’s Fan was very remarkable for that. I loved doing that play and was really bolstered by how it spoke to audiences. When you’re assigned a play, are you also assigned your cast or do you get to contribute? It’s more like an invitation, you’re invited to direct something. So you welcome that invitation and then you collaborate. One of the great virtues of the Shaw is it has one of the best acting ensembles in the world. An incredible group of actors. So you began a discussion, Jackie and I and with Cabaret, Paul Sportelli, the musical director, look at the ensemble and talk about people who might be good for the parts and we talk about those ideas. Sometimes the people come in and sing bits and consider them in roles. So it evolves quite naturally from there. Sometimes we go “this person would be great in this”. When a season is put together, Jackie of course is thinking of different parts for members of her company so it’s a very fluid kind of process. It’s open and very direct as well. 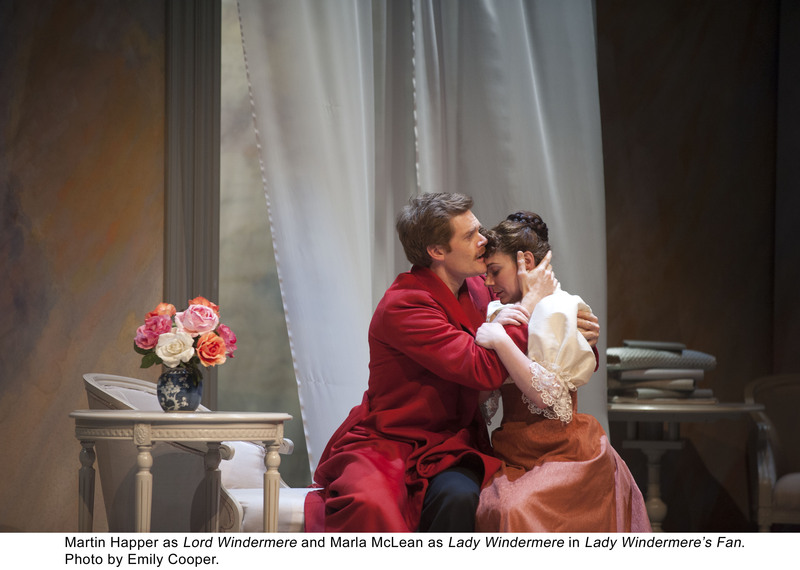 What drew you specifically to the cast members you had for Lady Windermere’s Fan? Well, with that play, it just speaks so directly into the skill set of the actors here. 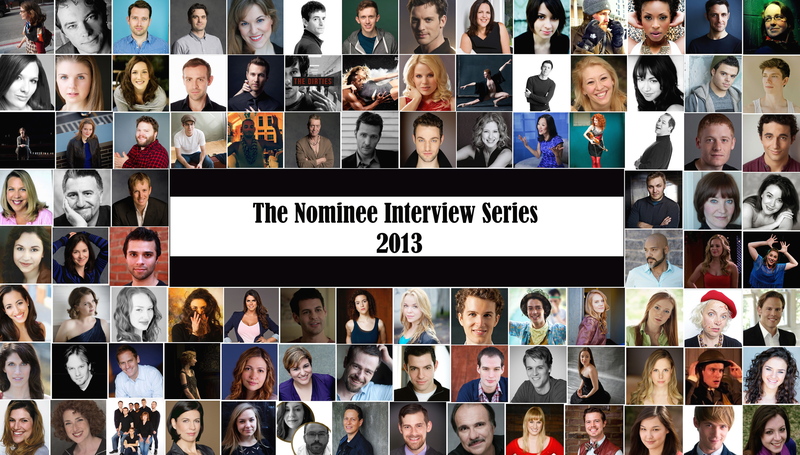 I think there’s a lot of younger actors in the company that straddle the sort of age range of those characters. Characters in Lady Windermere’s Fan, the gloss of youth is just leaving them and they’re facing the realities of their adult lives. And so actors like Marla McLean and Martin Happer were really well suited for the kind of dramas and dilemmas that Lord and Lady Windermere were having. And then you just have this incredible ensemble of character actors that are so skilled to do Oscar Wile and were really up for reconsidering that play in a new way. Well, here at the Shaw, it’s a repertory company, so you’re rehearsing the play while the actors are rehearsing other plays at the same time. And we rehearse over a 9-12 week period and that’s not every single day and it’s not all day long because of the repertoire. But it’s a really wonderful way of working because, in a traditional stock kind of scenario here the rehearsal is 3-5 weeks, you’re just, the actors often feel like when they’re given a challenge they have to produce it immediately. And in rep, you get this wonderful absorption time of osmosis. You can give someone a note and they can think about it for a while. They can let it go in. They can dream on it, they can absorb it. So you get a longer, I think richer process of discovery. 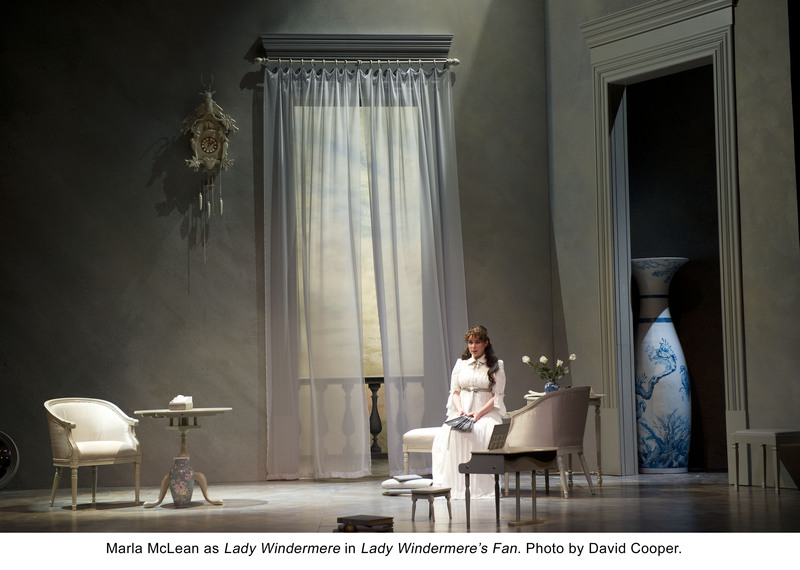 What did you bring to the play that was unique to your production of Lady Windermere’s Fan? When we think about Oscar Wilde, we often associate the ultimate, witty, bon vivant period plays. And those signatures are all through this- all his plays are set in summer time. All of them. There is this is kind of vision of Oscar Wilde in, you know, elegant costume, sets, and people standing about saying very smart things. And I think we forget they were once contemporary plays. His first word when you read Lady Windermere’s Fan is ‘time present’. Like he’s speaking right to his audience. And so I tried to bridge what’s necessary about the period to that piece and the modernity. While it was historically costumed and everything, it had a very contemporary frame and the staging devices for it were very modern. The music was very modern. The kind of moving camera aperture aspect of it was very filmic into it. So it was really fun, trying to bridge contemporary aesthetics to a very Victorian story. Your pieces tend to have really interesting aesthetics. Can you talk a little about working with designers on creating those? It’s one of my favorite parts, when you start working on a play, they’re really the first people you start sharing your ideas with, the designer, because the design is created so far in advance of the rehearsal, and the design defines so much about the production. What it’s going to look like, what the architecture and geography of the space is going to be. And it’s how the audience sees the story unfold. So I work a lot from inspiration from painters and paintings. With Lady Windermere’s Fan, Oscar Wilde was a huge influence on aesthetics and a critic and commentator on art at the time. In fact, he lived across the street from James McNeil Whistler and John Singer Sargent two of the most influential artists from London of this period. So we used a lot of their paintings as a point of inspiration. And that helps develop this dialogue as you see how the painting is speaking to the text, and is speaking for the drama, and how one is informing the other in that way. Do you have any dream projects you’d love to direct? I do. Yes, I always have this sort of shifting bucket list or whatever of plays I have to do before I die kind of thing. But it shifts and changes a little bit, though some things stay on there. And there’s some brilliant playwrights staying out there. Ibsen remains very high on that list. Shakespeare of course, Tomson Highway- writers that I think are just smashing. I would do anything to do direct plays by those writers. I’d love to do Oscar Wilde again, I would love to do Brecht again. There’s a lot of plays. Well you’re also a playwright yourself, right? Tell us a little bit about working in that capacity. Well, to me it’s very similar to directing. It’s just, where directing you’re making decisions about what that world looks like and how it is interpreted, as a writer you’re also just deciding what they’re going to say. So as a writer I approach it very similarly and a play for me being more with an idea than a given text. So when I’m working on a play it’s because there’s no play out there that can tell the story that I want to tell. So I have to write it myself. I sort of am a writer by default in that degree. But it’s really in line with my directing. A very similar creative impulse. So you are working on Cabaret right now, which is one of the early openers for the Shaw. Is there anything you’d like to tease us with for that production? Wow, our Cabaret is so fantastic. It’s such a fantastic, innovative, out there musical. I mean, that musical changed the way we think about the Broadway musical. I’m floored by it every time we’re working on it, thinking how much it changed about how musicals work. Prior to that, musicals were, you know, the music call came out of a book where people had such a high emotion that they would go from speaking into song, very narrative driven. Where here it’s song, songs in so many different ways. There are songs like that that come out of a naturalistic impulse, and there are songs that comment on the action, songs that have a sort of surreal quality, like they dramatize what a character is thinking but not saying to the other person. They have a kind of vaudeville political theater aspect, where they speak about ideas and politics of the time. So it’s a very, it’s so innovative. You feel like they kept saying what more can we do? How can we push the form? How can we make this content really, really reach people? And the budding musical in the early 60’s was very characterized by big splashy, biographical, historical shows. Things like Hello Dolly, Mame, Funny Girl. All wonderful musicals and they’re all right. But very much playing at the emotional heartstrings along. And Cabaret has qualities of that, but it’s also playing a morality with the mind, with the conscience and, do you know, the big image for Kandor and Ebb and Prince with Cabaret was a mirror? They had, when you came in the theater in the 60’s, they had a big mirror reflecting the audience. And you know they were saying, yes, this is about the rise of the Nazis, it’s about Germany in this expressive, decadent period but they were also saying, look at yourselves, see yourselves in that world and how does this world reflect your life? Our time. And so that’s very inspiring. I think you’ll see that reflected in a very unique way in this production of the show. And what else do you have on your plate coming up? Okay, well, I am adapting, it couldn’t get any different, for the Shaw, I’m adapting Lewis Carroll’s Alice in Wonderland, that we’re looking at for 2016. So it’s a couple years away, but you know, I’ve been working on this projects simultaneously so to go from Weimar Germany, Nazi Berlin one day to Oxford 1860s, little kids the next, it’s such a wild, and it just illustrates in a nutshell the kind of range of the mandate of the Shaw. You know the enclosure and sort of Victorian propriety of Lewis Carroll’s world to the wild adventure and explosion of Weimar Germany and Berlin. I can’t think of anything so radically different. So it’s such a great work out for the imagination for the director, writing muscles to be working on these two projects concurrently. And is there anything you’d like to add? Come see Cabaret! I just urge people to come out to the Shaw. The unique thing about the Shaw is getting the opportunity to see a few plays and seeing works in context. Like seeing Cabaret in context of the plays of George Bernard Shaw and his contemporaries, I think it’s a very unique, interesting setting.